Born: 1893, St. Peter’s, Norwich, Norfolk. 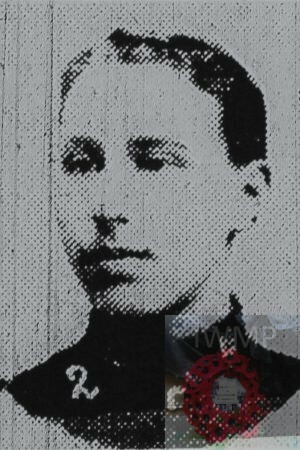 Died: 24th April 1915; age: 22; KiA at Hill 60. Residence: 29, Handford Road, Ipswich. Enlistment Location: Bury St Edmunds, Suffolk. Rank: Sergeant; Service Number: 8147. 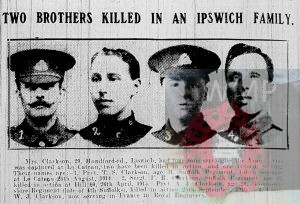 Mrs. Clarkson, of 29, Handford Road, Ipswich, had four sons serving in the Army. One was captured at Le Cateau, two have been killed in action, and one is still serving. There names are:- Prvt. T.S. Clarkson, age 31, Suffolk Regiment, taken prisoner at Le Cateau, 26th August 1914. 2. Sergt. F.R. Clarkson, Suffolk Regiment, age 22, killed in action at Hill 60, 26th April 1915. 3. Prvt. A.J. Clarkson, age 20, Gloucestershire Regiment (late of 4th Suffolks), killed in action 25th September 1916. 4. Corpl. W.J. Clarkson, now serving in France in Royal Engineers. Brother to ARTHUR JAMES CLARKSON & WALTER JOSHUA CLARKSON. 1901 15, Cauldwell Hall Road, Ipswich. Frederick was 8 years old and living with his parents & siblings. Studd Woodruffe Clarkson, 44, a Pavior Layer, born St. John’s, Colchester, Essex. Eliza Ann Clarkson (nee Woolner), 38, born St. James, Norwich, Norfolk. Thomas Studd Clarkson, 17, a Road Labourer – Layer, born Norwich. Walter Joshua Clarkson, 12, born Norwich. Blanche Harriet Clarkson, 10, born St. Peter’s, Norwich. Arthur James Clarkson, 5, born St. Peter’s, Norwich. Rosa Emma Clarkson, 1, born St. Mary’s, Norwich. 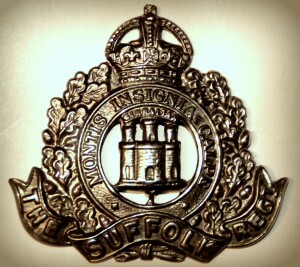 Frederick was 18 years old, a Soldier ranked Private in the 2nd Battalion of the Suffolk Regiment. Basil Robert George Clarkson, born 1914, Farnham, Surrey. Soldiers’ Effects to Marie L. Haragan – widow.